Fixed Price Loft Extensions in Chiswick W4. Consistency is the key for Greendawn Build Ltd. Every one of our loft extensions get the same level of attention to detail right from the beginning. Greendawn Build Ltd offer Fixed Price Loft Extensions in Chiswick W4. A complete design and build package with no surprises so that the budget is met every time with no surprises. Week 6 on a Design and Build Loft Extension Chiswick London W4. Now that the roof is on and the house is watertight we can move onto the internal finishing. There are other benefits to putting a whole new roof on to the house too – it won’t need doing again for a long time so maintenance costs are significantly reduced. 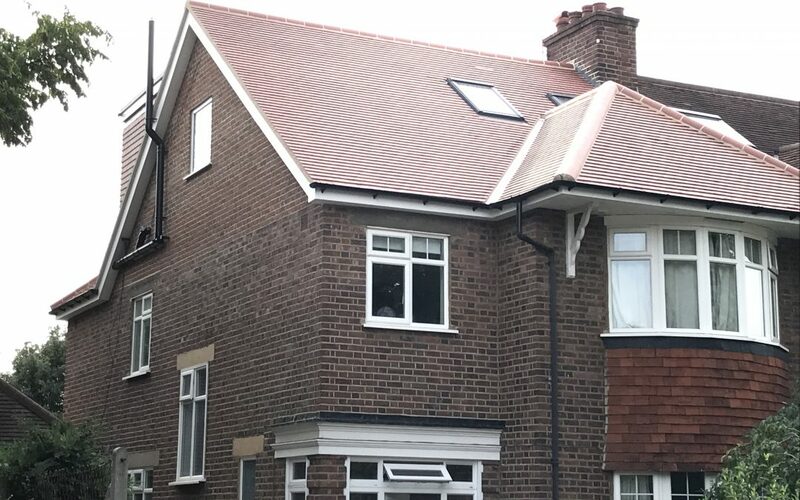 We only use materials that match as closely as possible to those used when the house was originally built and for this one we opted for Rosemary Red Plain Clay tiles. The bricks used for the new gable end have been matched to the existing and are an almost perfect match. We want all of our lofts to look as seamless as possible and to look like it was always there, both from the inside and the outside.